Join me later today for a winter pendant tutorial (via video) with Brenda Lansdowne of B’Sue Boutiques as we bring you a fabulous and easy way to make your own pinecone with leaves and berries! 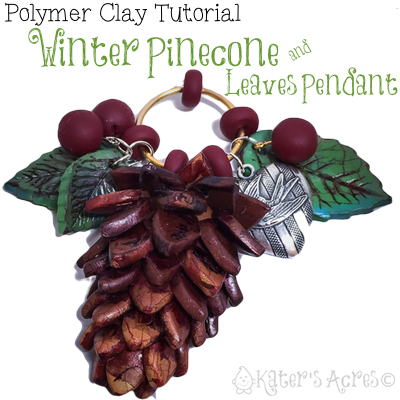 This super easy winter pendant tutorial will show you how to make your own polymer clay pinecone, leaves, and berries to form a giant focal pendant for a rustic, simple, and balanced necklace. Add “One Step Crackle” to seal your beads. Add acrylic paint after crackle has dried to “age” the cracks and make them more visable. Varnish beads with matte varnish to help protect without the glossy shine. Yes, the “petals” are called scales. The needles are the green pointy “leaves” on the branches. I know that Wikipedia says that the Coulter Pine makes the heaviest pine cones, but there is a type of pine in Australia called the Bunya Pine that produces cones that can weight up to 32 pounds! Thanks so much Doreen! I’m so glad you helped us solve that issue. I’m glad you liked the tutorial as well.